Everybody loves a special edition console, what with their unique color schemes and limited nature. But what about a special console that also looks like not one, but two Pokemon? Do you think the human mind is even capable of withstanding such ridiculous levels of adorableness? Well I hope so, because two Pokemon: Let's Go Switch bundles are coming November 16, and their cuteness cannot be denied. 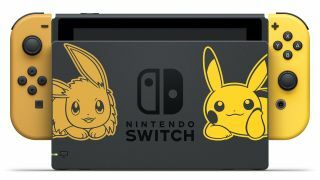 You can get the Pokemon: Let's Go Eevee special edition Switch bundle - which comes with a Nintendo Switch featuring a special design and uniquely colored Joy-Con controllers, a copy of Pokemon: Let's Go Eevee, and the Poke Ball Plus accessory - or the Pokemon: Let's Go Pikachu special edition Switch bundle, which trades out Let's Go Eevee for Let's Go Pikachu. In other words, while there are two bundles, there's only one new Switch design. Nintendo has typically been very good about its limited edition consoles clearly representing a specific franchise without being garish or tacky about it, and that shows through here. I like the minimalist silhouettes on the back of the Switch itself, and the fact the Joy-Cons have complementary-colored wrist straps. But most of all, I like how the Pikachu and Eevee designs are positioned in such a way that the Joy-Cons themselves look like their tails. Okay, you have to squint a bit and use your imagination, but it's still cool! You can pre-order a Pokemon: Let's Go Switch bundle now, for $400. If that seems a bit high, remember along with the console and game, you're getting the Poke Ball Plus, which tacks on another $50 to the price (but it'll make you feel more like a real-life Trainer, comes with a Mew, and lets you catch Pokemon in Pokemon Go without checking your phone, so decide for yourself if that's worth the extra scrap). Haven't fired up Pokemon Go in awhile? A lot has changed since the game first launched! To get caught up, check out our Pokemon Go trading guide, as well as a walkthrough on how to catch Celebi in Pokemon Go.